eHome renovation can be an exciting, stressful, and expensive undertaking. One of the biggest cost arenas when it comes to interior design is usually the floors. Replacing your flooring with something new may seem appealing, but it’s also going to cost you. If you’re ready for a change in your flooring, or if your current flooring is looking a little dull, why not just give it a facelift? People oftentimes will tear out perfectly good floors whose only crime is being a little tired-looking. With the right finish and an expert hand, though, you’d be amazed at how much your floor can transform. For a fraction of the cost of new flooring, applying an epoxy resin finishing can make that tired-looking floor look better than new. Also known as liquid glass, epoxy resin finish gives even dull materials like concrete a spectacular shine. These finishes come in a variety of colors, and there are even multi-colored metallic options available. You could even get a style that resembles marble flooring, or work with a designer to come up with a pattern completely unique to you. When done correctly by finishing professionals, epoxy resin finish transforms your boring concrete floor into an artistic masterpiece. The concrete is the canvas, and the finishing expert is Michelangelo. If you like the look of concrete or tile as is, you can also pick a clear finish that will just enhance the existing look and protect your floors from further damage. Aside from stunning aesthetics, there are many other benefits to epoxy resin finishes as well. We already noted the cost savings as opposed to installing new flooring, but did you know it could also save you money on your utilities? The gloss helps reflect light and keep your space cool, cutting down that electric bill. 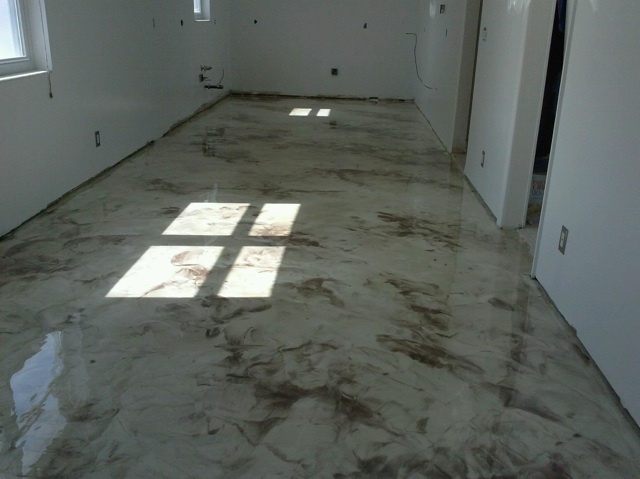 Epoxy resin finishing also does an amazing job of protecting your floors. Epoxy finishes are incredibly hard and durable, guarding against stains, cracks, and other potential threats to your floor. a lot of careful maintenance and is easily damaged. Epoxy resin finishing, on the other hand, requires little more than a microfiber mop and some water from the tap to keep it strong, clean, and beautiful. To ensure even greater protection, simply wax your floors lightly twice a year. Does someone in your home suffer from allergies? You won’t find any dust mites or molds hiding in your epoxy finished floor, helping the whole family breathe easier. and artistry. Sought out by homeowners and architects alike, Highlands Concrete Finishers is the most trusted name in floor finishings.